In java what is a difference between List Vs. ArrayList? In other words, have you ever wondered what is the difference between Arrays.asList(array) and ArrayList<Integer>(Arrays.asList(array))? This one is a simple Java program which demonstrates the difference between both, i.e. List Vs. ArrayList. Here crunchifyList1 is of type ArrayList.. Very simple. Here crunchifyList2 is a fixed-size list backed by the specified array. In our case it’s of type Integer. Also it’s of type List and not ArrayList. What is a difference between List and Arraylist? Answer is very simple. List is an interface, ArrayList is a class that implements List. 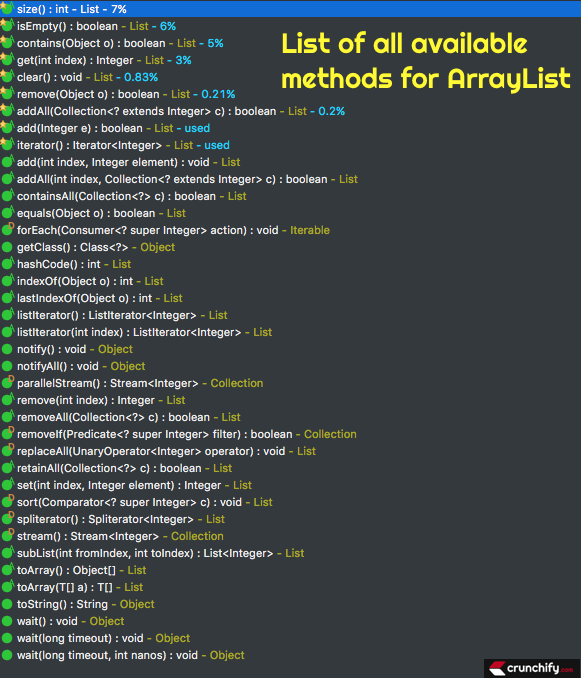 Below are the list of all available methods for ArrayList. Take a look at below Java program which clearly explains you the difference between the same. crunchifyList2.add(12); // add() method is not allowed to crunchifyList2. // crunchifyList2 is returned as a List view, it has only the methods attached to that interface. // iterator() returns an iterator over the elements in this list in proper sequence. Just commented out above highlighted line 27 and rerun the program to see below result. 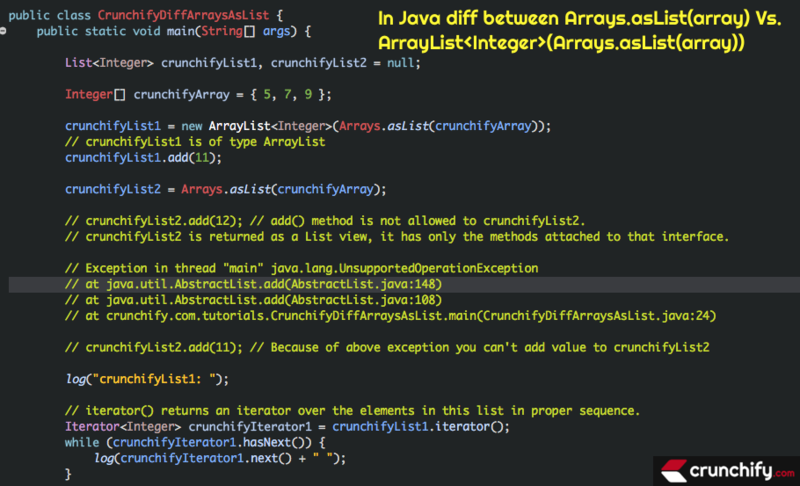 Hope you get clear picture about the difference between list vs arraylist in Java. In Java How to Find Common Elements of Two UnSorted Array?